Dr. Ralston is a State Medical Examiner in the Office of the Chief Medical Examiner for the State of Kentucky. Dr. Ralston is a member of the American Academy of Forensic Sciences, and National Association of Medical Examiners. Dr. Ralston has held faculty appointments at the University of Louisville and the University of Kentucky and lectures throughout the United States to many local and regional law enforcement agencies. Effective investigation of events involving injury or death requires recognition of patterns of physical findings on the body and at the scene. Such recognition is necessary to properly interpret the significance of the finding, and integrate this information into the case as a whole. Early recognition of certain patterns of injury on the human body allows the criminal investigator to properly assess the scene and begin proper procedure for collection of relevant evidence. This course consists of the visual presentation of hundreds of cases of injury and death, including homicides, suicides, accidents, and deaths from natural disease. Many cases of nonfatal injury are also presented, including accidental and inflicted injury in children and adults. Important investigative aspects and patterns of injury of sexual assault cases are discussed. Characteristics of self-inflicted injuries are contrasted with injuries from assaults by other persons. The course begins with an introduction to forensic pathology. Medical terminology frequently used by forensic pathologists is illustrated and defined through visual example and case presentation. It is important that investigators have a good understanding of such terminology, to understand the importance of various physical findings to their cases. 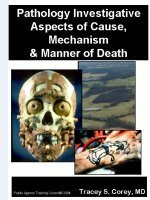 Cause, mechanism, and manner of death are discussed and defined. Each is discussed in depth, through case example. Estimation of postmortem interval and time of death are discussed. Patterns of decomposition are illustrated. The reasons that these changes occur are explained. Integration of physical findings on the human body with scene findings and historical information is stressed. These scene findings include bloodstain patterns and other important but often overlooked pieces of evidence. Proper recognition and collection of such trace evidence is emphasized. The investigator is shown common patterns and causes of sudden natural death. Common risk factors, scene findings, and histories seen in sudden natural death are illustrated. Various causes at different age ranges are presented. Categories of injury are then explored through example. Blunt force injuries and sharp force injuries are illustrated, and their production is explained. Scene findings including blood patterns in these cases are illustrated. Blunt force injuries are compared and contrasted with sharp force patterns. The investigator will learn to recognize patterns produced by various types of instruments, and the common ways such patterns are produced. Injuries from firearms are discussed. The investigator is taught how to differentiate entrance wounds from exit wounds. The investigator is taught to recognize physical findings to allow estimation of range of fire in handgun wounds and shotgun wounds. Patterns arising from distinctive types of ammunition and weapons are shown. Other types of injury and death to be illustrated and explained include: asphyxia, drug-related deaths, fire-related deaths, electrocution, drowning, and motor vehicle collisions. Patterns, diseases, and investigative approaches unique to the investigation of injury and death in children are given special consideration and discussion. 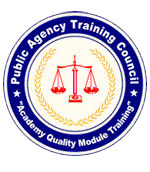 The unique investigative approach required for pediatric cases is emphasized. At the conclusion of the course, the investigator will possess a good visual library of common pattern injuries that will facilitate recognition of these patterns and their significance early in the investigative process. The investigator will recognize subtle trace evidence, and know proper collection and preservation thereof. The investigator will be able to maximize investigative effectiveness by recognizing the significance of physical findings on bodies and at scenes. The investigator will be able to integrate this knowledge base into the facts of a specific case to draw sound and defensible forensic conclusions. We see what we look for, and we look for what we know.